As any teacher will tell you, the last thing they want to be doing is faffing around with technology during a lesson. An easy way for a lesson to go quickly south is to be relying on a piece of technology to work there and then, and it suddenly doesn’t. Cue descent into chaos and a carefully planned lesson unravelling. This is one of the reasons why the iPad is so appealing in education, because it isn’t a faff (and this is coming from an Android fan). There are also certain apps on the iPad which work in an extremely straightforward way and do something very useful in the classroom. 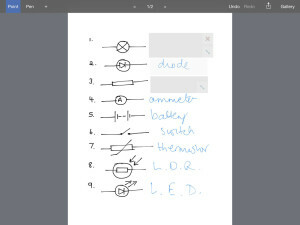 Classroom PDF is one of those apps. 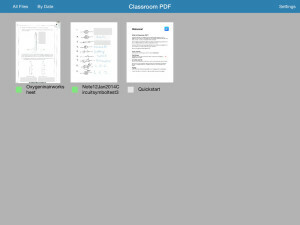 Classroom PDF allows you to import a PDF into it from the now standard email or cloud storage via the iPad’s ‘Open In’ command. The headline feature of this app is the ‘cover’ feature which will add a moveable and resizable rectangle, or rectangles to the PDF. “Boring! !” I hear you cry (possibly in a Homer Simpson voice) and, this may not sound like much, but doing this enables me as a teacher to cover key words or answers which I can use in discussion with my class. The brilliant thing about this app is that as most teachers will testify, a lot of our resources are PDF and the ‘cover’ option provides an extremely simple way to block out the parts of a document we may want our students to discuss without giving them the answer. I do not have to edit or change the original document to cover or erase answers, I can do it in about 2 seconds with Classroom PDF. It’s a dream from a workflow perspective. The app also offers other options, like pen annotation and laser pointer for use during AirPlay to a class projector, but for me the ‘cover’ system is so simple to use and I could incorporate this into a lesson seamlessly without any fiddling about. 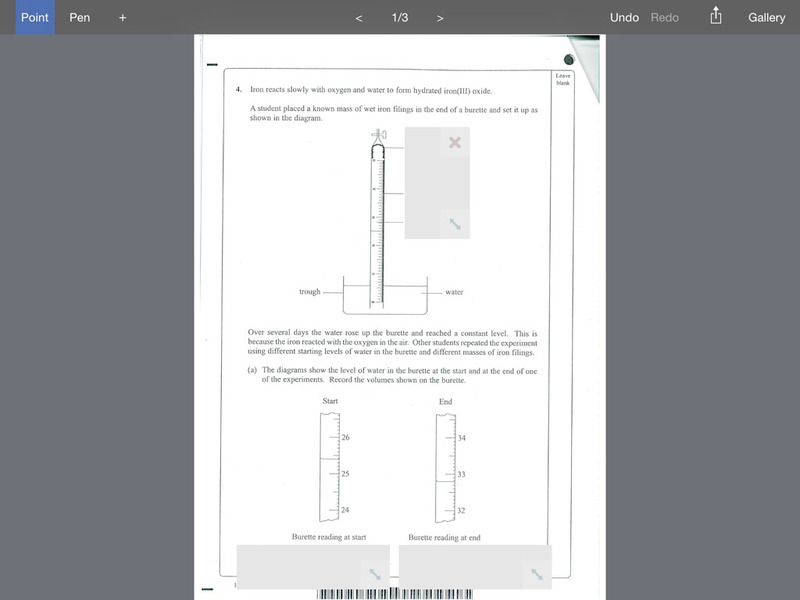 The other feature of this app is that a quick tap on any of the cover rectangles will render it transparent so you can quickly display the answers to your class without having to stack up a pile of rectangle graphics in the corner of the screen. It also does the simple things right like when you add a new cover it automatically resizes to the last rectangle. Again this is very useful, especially if you need a uniform size for an answer rubric. 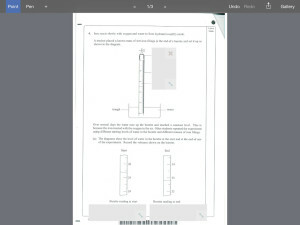 You can also tag PDFs with colours and names so you can easily tell them apart if you are teaching different subjects. Classroom PDF isn’t an all singing, all dancing app but it’s better for it. Putting too many random features in it would be to its detriment as most other apps, like Notabililty or GoodReader for example, handle PDF editing fantastically well. What these apps don’t do however, is make the cover system on a PDF anywhere near as easy and straightforward to use. 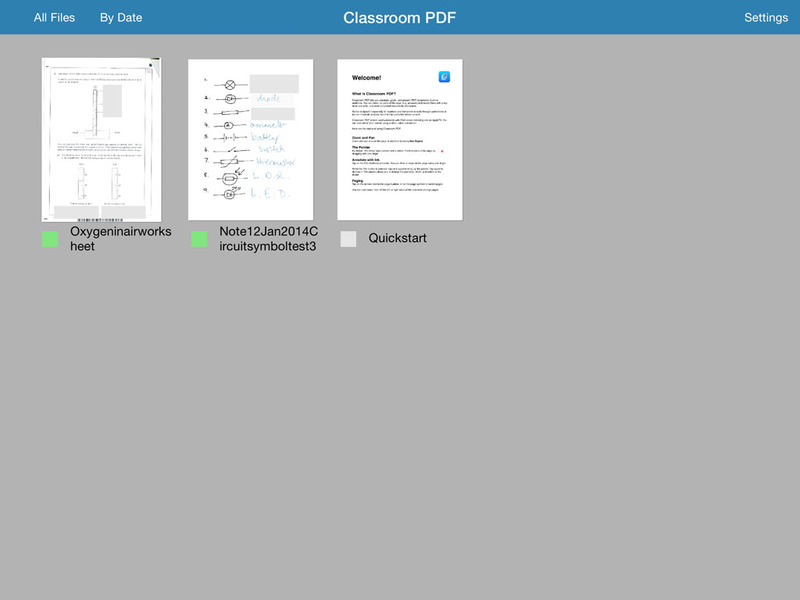 It’s just a small thing, but if you have loads of PDF resources in your teacher toolkit, this app brings a new, and more importantly seamless, dimension to using them in the classroom. Disclosure: the developers provided a promo code for this app.